If I had to pick one brass band recording to add to my collection, I would choose this 2007 release by the world famous Black Dyke (formerly Black Dyke Mills) Band, conducted by Nicholas Childs. Entitled Symphonic Brass, this CD contains brass band arrangements of popular symphonic works, as well as a few other pops concert type pieces. Here’s a complete track listing. The arrangements are, as far as I can tell, literal, and they play every note! If you haven’t heard of the Black Dyke Band, see a brief history of the band here. They have won a number of awards and competitions over the years, including multiple national championships in Great Britain, as well as Grammy and Oscar nominations. For a taste of what’s in store on the rest of the CD, here’s a brief clip of “Jupiter” from Gustav Holst’s The Planets, arranged by Stephen Roberts. As expected, the technique and overall virtuosity on this recording are outstanding, but I think what impresses me the most is the lyrical quality of the playing, and the variety of colors they produce. In the “Nimrod” movement from Elgar’s Enigma Variations, the entire ensemble plays with a sustained quality that many orchestral string sections would be envious of, especially at softer dynamic levels. The louder sections also deliver, particularly the low brass, whose sound I can only describe as extraordinarily healthy. 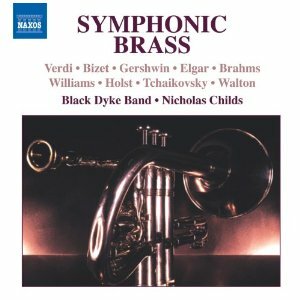 If you are a fan of great brass playing, check out Symphonic Brass – this recording is both technically impressive and musically satisfying.